1 Peel white asparagus over the entire length of stalks, peel only the lower third of the green asparagus. Cut off the woody ends of both varieties. 2 Rinse sage, shake dry and pluck off the leaves. 3 Bring salted water to a boil in a pot. Cook white asparagus for 12 minutes. After 6 minutes, add the green asparagus. 4 At the same time, cook the lasagna noodles in a second pot of boiling salted water according to package instructions. Clean truffles with a brush or a knife, rinse briefly and dry. 5 Shortly before the end of cooking the asparagus, heat butter in a skillet until frothy and fry the sage leaves over medium heat briefly. 6 Lift asparagus out of the water, drain well, add to butter in skillet and season with salt. 7 Drain lasagna noodles and arrange in alternating layers with asparagus on plates. Drizzle butter around the asparagus. 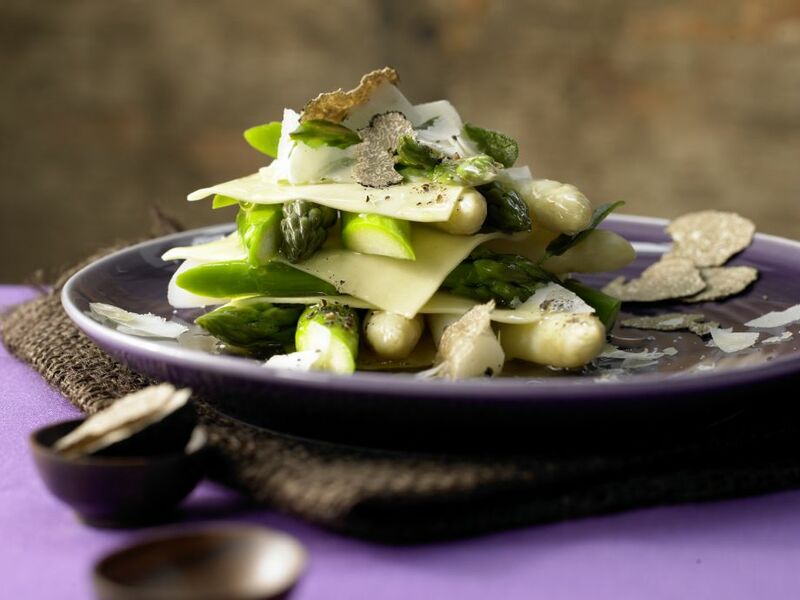 Top with Parmesan and truffle slices and sprinkle it with plenty of pepper.